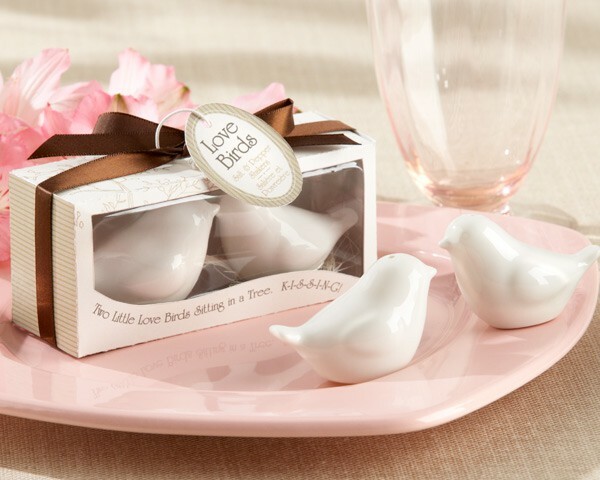 Love Birds mate for life, so what better romantic favor than a Love Birds Salt and Pepper Shaker Set? Honor the two love birds you're celebrating with this stylish set of white, ceramic, bird-shaped salt and pepper shakers nestled in natural raffia nest. Comes elegantly packaged in a ivory-brown, matte-finish gift box. 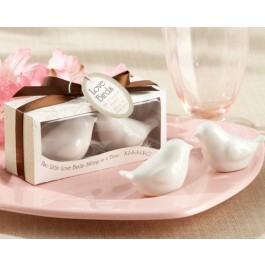 The inside flap reads "Two Little Lovebirds Sitting in a tree K-I-S-S-I-N-G!" A chocolate brown-satin ribbon and bow complete the presentation. The gift box itself measures approximately 2.25" h x 4.25" w x 1.5" deep.